Super remote improbable long shot I get to see Myles next week in Paris. WOOT. Nothing But A Name live. I think he did it. He played all the songs from Year of the Tiger at least once. I think he played One Fine Day at some point in this Europe tour, but I can't find footage of it to verify it. anguyen92 wrote: WOOT. 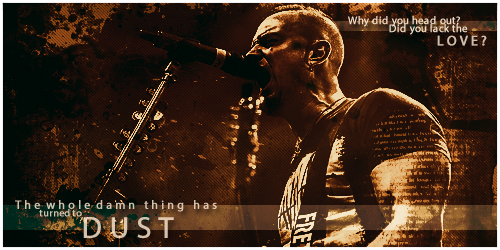 Nothing But A Name live. I think he did it. He played all the songs from Year of the Tiger at least once. I think he played One Fine Day at some point in this Europe tour, but I can't find footage of it to verify it. Back from a soggy Steelhouse Festival in Wales... Myles is the only front man to get me to an outdoor gig in the UK. Great set with '& Co' and he seemed super chilled. Even the driving rain didn't dampen my enthusiasm (or his!) He performed Addicted to Pain totally acoustically and that made my night, plus his Iron Maiden cover was really well received by the crowd as he was playing on The Trooper Stage - pretty cool. Check out YouTube for Myles performing with Glenn Hughes last night, just awesome. If you guys wanna know what it feels like to be an acoustic guitar. Any ideas if MK if extending his MK & Co tour to the U.S., or is it all Slash from here on until AB 6 recording time in the new year? I got to Paris with my family the morning after his show there. I knew ahead of time our itinerary wouldn't overlap and let me see the show, but that's the closest I've been to one - any - of his shows and it was still super painful to miss it. Can't link poster at the moment, but on Myles' twitter, he stated that he's doing a show in his hometown at Spokane, WA at The Fox on December 14th. Will bring his "and Co." band. Don't think this will result in a tour. This may be a one off since it is a local show for him. Would be almost exactly a year at that time since the last AB show....... also held in Spokane. 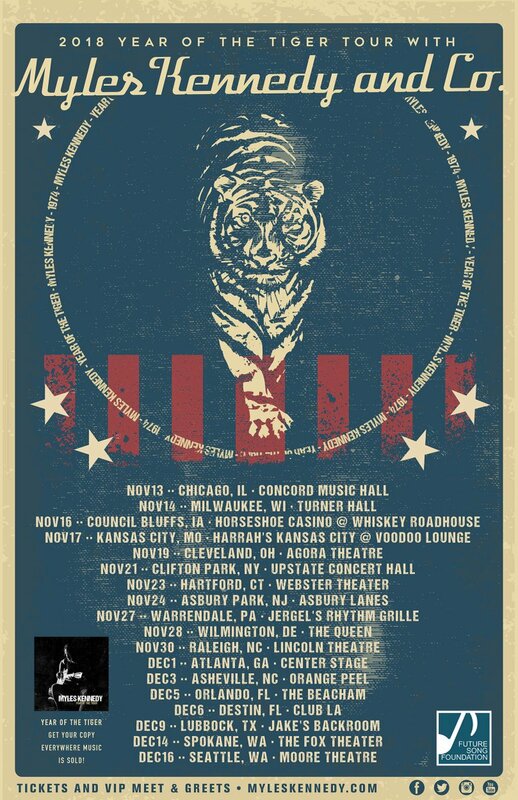 One more round in the states for the Year of the Tiger solo shows. Sorry, Greg. No Denver for you. Sadly, there's no California shows as well, but I'm still happy with the show I went to back in May. I just want to see more, dang it. Here's the poster. Seriously. Not a single show in my time zone. It's way the hell better now that they added Denver on Dec 11 YAAAAAAAAAAAHHHHHHHHHHHHHOOOOOOOOOOOOOOOOOOOOO!!!!!!!! Is anyone having trouble getting tickets for the Orlando show? I've already bought two tickets but have to get a third as another friend of mine wants to go. Every time I try to buy another though it says that an error has occurred and I don't know why. I'd imagine if they were sold out they'd say as much, right? ^^ No clue. I say keep trying to get tickets on the same site or get onto another computer. 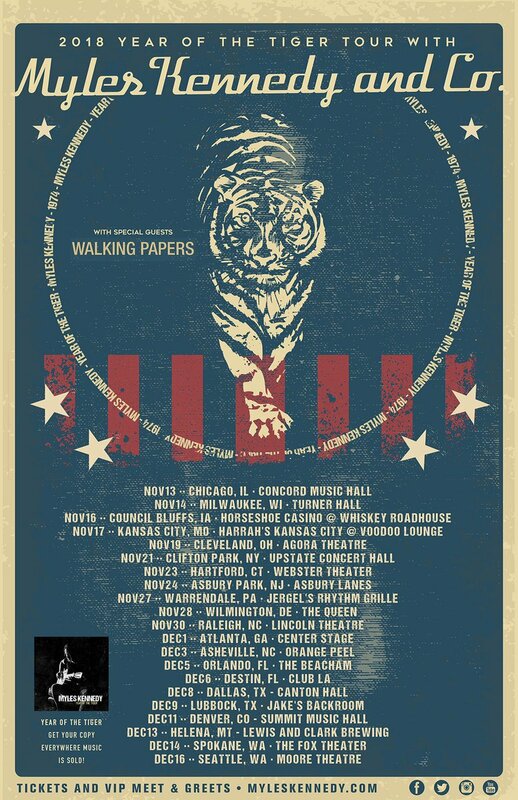 On a side note, in an interesting surprise, Walking Papers will be supporting Myles for the US leg. Sadly, Duff McKagan will not join them on tour as he will be touring with GNR in that time period, but you still got Jeff Angell and co. and they should be solid enough to give people a good support set.